I hope this takes the struggle out of duplicating this concept. I saw a bunch of stuff that didn't make sense cause it doesn't REALLY show the simplicity. When you watch this, just make it, it works. I appreciate the private messages I get, but when it is to ask me specifics about the circuits, etc... It gets a little overwhelming for me to respond to all the questions. I do enjoy answering them but it is time consuming. THAT IS WHAT THIS FORUM IS FOR. Post the question for EVERYONE to see. There are so many people here much more skilled than me and it is good to see a more wider perspective than mine when it comes to answering those questions. Also, I get a better opportunity to learn by seeing the other responses. hv diode or a lot of smaller low volt ones in series. so I bought a resistorless one today to see a difference. point is, you know the concept. Gotoluc and Ossie showed this particular variation! There are more and other enhancements. Gas pressure analogies...get them in mind and you'll figure out more. Anyway, the best way to personally support this open source sharing from me personally is by using the Energy Mastermind modules. Many people do this as a hobby and have a full time job already. PATHS is my full time business and this forum is part time...and does take time and money to learn. Last edited by Aaron; 04-25-2011 at 07:07 AM. Last edited by Aaron; 04-09-2018 at 12:11 AM. I believe I have found a way to change water to a fuel. "Ganga Shakti - Water Power"
If this is the first time you are viewing this page I ask you to share this link immediately to everyone you have in your email address list and ask them to do the same no matter what you or they may think. We need to give this back to the World a.s.a.p. Next I ask everyone to stop experimenting if you can and help with this, since I believe it is the one of the most promising real effect at this time (that I know of) that is fully shared on the Internet. Nothing will be hidden here. You can view the development of everything that is going on. Now let me give you some background on this. For a couple of years now I was a member of a Yahoo Group called: WaterFuel1978. At this group user name: s1r9a9m9 claims to have one of his cars working on water and says that one of the parts he uses to do this is an inverter and also some relays. However, no one to date have been able to replicate it and the site dates back since, Jul 30, 2005. On or around June 25th, 2008 s1r9a9m9 posted 2 videos on youtube to show a 18HP one cylinder engine running on water. The video is quite convincing, however he is hiding the important parts to make this work. Dear S1R, thank you for the 2 videos which now would make it very hard to say it does not work. to think that all this time you have been a chosen one to put the pieces together that could change all that... and what do you do with it, hide it, just as they do. good for Billions of others I would think of that as a great sin and your life could be in much greater danger than you think. All who have tried to control their inventions that could of made our World a better place have lost their life over it or have been bought out just to hide the information. I'm sure Stanley Meyer would do it differently if he had a second chance but it's too late when your dead and the knowledge is lost. that is protection if you think you need it. By hiding things you are doing exactly as they want and that makes a small target for them since it is not spread out and can be easily extinguished, 99.99% of the World won't even know it has happen. I have believed for many years that water could be used as a fuel. The next day I posted the message to s1r9a9m9 I started a replication attempts of his system and while working on it I accidentally shorted the DC side of the bridge rectifier and saw a flame spark which made me think of plasma. So I tried many different circuit possibilities to try and incorporate this short circuit effect when the high voltage spark jumped the gap. After 2 days of work I came up with a very simple circuit which is posted at the bottom of this page. I had to work hard to make the circuit so simple since our minds think something like this should be complicated, so don't come to the conclusion that something so simple will not work until you try it. At the botton is my original circuit but I updated the diode part number and the quantity thanks to user name: callanan's added his improvement ideals. His circuit is more complex than mine and could work for you if you are advanced enough in electronics but one way or the other I would recommend (if you want to replicate) that you start with the simple circuit first and after seeing the effect you can add the extra components if you wish. Please note that I believe both circuits give the same effect. Also, please note that most Spark plug have a resistance in them which needs to be removed. In many models of Spark Plugs you can remove the resistor by heating up the ceramic around the top electrode to unlock the seal and then unscrew it and remove the resistor and spring and replace it with a piece of 10 gauge copper wire or 3 pieces of 14 gauge regular home copper wiring to complete the contact. Make sure the wire you added touches the top electrode just before it sets when you are screwing it back in. The gap of the plug can be standard but you could play with it after a successful replication and see what it does. We will be testing all these things and updating this page with the most current information, so keep checking this page for updates. A note about the video above. I realized only after seeing the video that you cannot see the complete flame that I was seeing when doing the demonstration video. There's a orange red glow around the spark when the water explodes which the video does not pick-up. Also I did not realize at the time when shooting the video that the air was getting very humid in the garage since it had started to rain outside and the door was open. This is why the spark plug was continuing to show explosions which surprised me while I was video taping. Also take note that not much water is needed to see the glow and you can kill the effect if you add too much water mist. Thank you for looking and please remember to Share. Last edited by Aaron; 07-14-2008 at 10:44 PM. I bought some ngk sparkplug at schucks for about $2. Some NGK's I had were about 4.5k ohms and one champion one I bought had about 25k ohms. So anyway, just ask for one WITHOUT a resistor. Seems to be used for lower voltage systems like motorcycles. So easy to find. Krupa's spark plug has no resistor. Anyway, I think that sparkplug has no hope of becoming commercialized with this breakthrough because I think it may make it obsolete. ROSCO, you're the plug expert, can you verify these results under compression? I did use the resistorless NGK motorcycle plug and sprayed water and it does explode water mist like in Gotoluc's vid. Would be interesting to see this circuit sparking your Firestorm duplication! Guy at store said if it didn't have an R in the part number then it didn't have a resistor. He almost wanted to prove it to me with the tech books. lol - if it is that simple, then ask for a plug without an R in the number. If that is true, then simple to get a plug without resistor. Also, as a thought, I wonder if Robert Krupa had his ignition system setup like this to make the firestorms do what they do??? Anyway, much easier probably to just buy one without a resistor. HV rod in Gray Tube has no resistance. Here are some of my thoughts about this. 1. DANGEROUS very high voltage need to be extra careful on this one. 2. FUN! but safety wins out with me over fun. Trips to the hospital are no fun. 3. 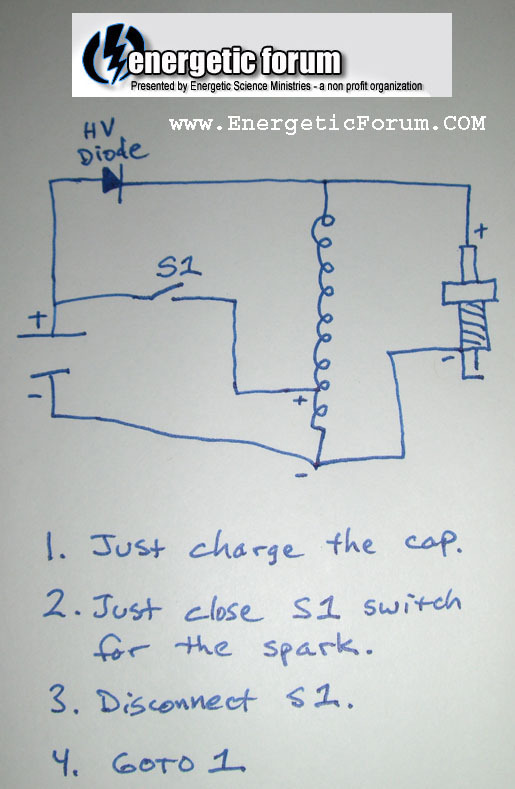 I was thinking of running my SSG with this.... builiding a circuit that would build up the cap to 45 V, then hitting the SSG with the power stored in the cap. These words come to mind from free energy generation book. Do not do this experiment unless you have some knowledge of the components.... batteries make hydrogen, and given too much voltage they can spark internally and you have exploding sulfuric acid everywhere. But, I have been thinking about this, why not make a custom made engine that would use this. take an atomizer with water like a fog machine and pipe it into a chamber with the sparkplug. .... but I am so drawn to this experiment, it show soo much promise, much energy out for so little in. I am thinking about the nebullizers they use with children to help them breath. I see them on ebay all the time. it would go thru a hose and should be ideal for feeding a mist to the plug. Mart, I think that those nebullizers are also using an ultra sonic fogger in them. But you can buy the fogger alone cheaper. It costs about 30$ on ebay. Anyway, I put this circuit together. Instead of inverter I am using a variac. The capacitor is 150uF 400V and all the diodes are IN4007. There is no sparkplug, just two bolts with the flat sides facing each other. The air gap is about 0.5mm. The capacitor is very leaky so I need to fire it just as I turn off my variac. Got some nice bangs. Then I sprayed a little water over the electrodes. They got wet, but there were no water drops formed between the electrodes so that they are touching through water. The wet electrodes gave a bit bigger bang than when they were dry, but I could hardly see any difference in spark appearance, maybe it was a little more red or yellow, but it is gard to tell. I am thinking that maybe we could put the spark gap above a can of boiling water, so that when the steam comes up and through the spark gap, we could fire it. Those are two neo magnets attached to the + terminal of the cap. Last edited by Jetijs; 07-04-2008 at 05:54 PM. You'll have to excuse me but I don't see any extraordinary in the circuit you made. 1. You charge capacitor to some small voltage (I guess 110-250V if you using a standard inverter). The voltage is simply too low to allow for capacitor discharge over sparkplug electrodes. 2. You close switch discharging the capacitor into the primary of the ignition coil (the good old CDI concept) thus causing the high voltage spark to jump over the electrodes of the sparkplug. The high voltage spark will cause local media ionization thus allowing for the low voltage/high current source (inverter) to produce high current (and high temperature) arc. Of course extremely high temperature of high current arc will explode water vapor or steam. But then again if you take any extremely high temperature object and put it in contact with steam it will explode it. I also looked at the links to another forum you provided and they're using pretty much the same concept. I maybe missing something but I don't see how is that related in any way to Gray tube electro-radiant event? I admit it is a great way for causing hot arc in order to explode water steam but the way I see it it's nothing more than that. Last edited by lighty; 07-04-2008 at 06:03 PM. Look at his new video.... he is much better ..
Lighty I can do this discharge constantly at higher frequency. It is STONE COLD. I can also have the HV diodes coming off of the + of the BRIDGE when the bridge is disconnected from the cap AND with the inverter turned off....and it gives me the same effect...so there is no high temp high current arc across the gap. The HV output of coil seeks ground at the HV diode that is connected to common ground since that is paths of least resistance. It does find ground there there since it is in contact with the low voltage potential. Diode slams off and slaps it hard and it has nowhere to go but to ground at plug. That is what is happening...it is a very simple electroradiant event like what the Gray circuit produces but on a much smaller scale. Hi everyone, just dropped in to see how things are going here and as I can see Aaron is doing an excellent job . Thank you Aaron for helping others to understand what is going on in this simple but effective circuit. Do you think this could be the working principal of lightning also? I'll keep watching your progress. There is already enough info here in this thread to get plenty of people started. I'm happy to send people your way to that thread as I already posted links to it. I understand that some things like this are just too simple and just pass by the wayside because of lack of belief that it can be that important...I am hoping you and anyone else working on this keeps pushing it like a mad dog on steroids. This method follow the rules of what needs to be in place to unleash an electroradiant event...serious fragmentation of a voltage potential. Spreading a certain amount of voltage potential over a larger cubic area of space. My experiments today show me that capacitance is virtually irrelevant and it is all about the voltage. I went up in capacitance for the same voltage...no matter what, the effect didn't improve...and didn't necessarily diminish either going down in capacitance. People want caps and strobes to play with. Don't buy them. Tell people to go to a grocery store that processes film. Say they're working on a science project and need a haldful of the disposable cameras that already have the film ripped out. They have caps about 120uf and 120v or so plus the battery and charging circuit plus the strobe, etc... I went to one store about 7 years ago and I got about a dozen of them. Personally, from the simplicity of this, I think the gas production requirements posted by the "gurus" of water gas production are bogus and are meant to distract people from the real secret. Meyer shows in the first patent and last patent about spark discharge and then spark at the plug. With the potential of this method, I can see how it is possible to run an engine on just water vapor, but an obvious enhancement to make it work really easily is that any engine running on it can easily produce a good amount of HHO gas from a booster to add to the moisture. This is where I think it needs to go. Over all this time, nobody has created enough water gas to power an entire car. All the effort.... even with claims of hundreds of percent over Faraday, that isn't nearly enough. However, the amount people are currently making with everything they have tried *COULD* just be enough already...if they were using Krupas plug...but that may be unnecessary anymore...cost me about $2 for a NGK resistorless plug at Schucks. About $1 worth of diodes. Cars already have ignition systems in the car with the coil and battery and caps are free in those cameras sometimes for the asking. If the potential, no pun intended, of this whole thing is apparently as simple as it sounds...and from collective experience on all these things together, this is an irresistible offer that cannot be turned down. I hope this rapidly becomes one of the most popular experiments in the world in the "free energy" field. I have a feeling there are more things to surface really soon. With his plug the annode is very large surface area like a mushroom head. If you take x mount of voltage potential and divide it by a certain surface area...there is more ability for it to fragment itself apart than with a small surface area. Anyway, this is an awesome breakthrough Luc and if there are any further updates that you want to get out to a lot of people, just post them here and a lot of people will see them. OK, your last video showing measurements of capacitor potential with both inverter and capacitor disconnected did clarify things considerably. I didn't realize that capacitor after a discharge through a primary retained any kind of charge. I am now more inclined to agree with you on the comparison with Gray tube. Could you please do a simple experiment- just reverse polarity of the whole system and compare results with the ones you tried already. By reversing the polarity of the system I mean connecting common ground to (+) of the inverter output instead to (-) as well as reversing the polarity of the high voltage diode. That should provide you with a positive high voltage pulse striking on positive retained charge on the capacitor. Positive charge striking on positive charge sometimes behave differently then negative charge striking on negative charge. How to harness this spark? Where can one get the switch they use in the diagram found on overunity page? Last edited by theremart; 07-05-2008 at 05:09 PM. I understand that some things like this are just too simple and just pass by the wayside because of lack of belief that it can be that important...I am hoping you and anyone else working on this keeps pushing it like a mad dog on steroids. Did you say in a vid or posted somewhere you used as small as 2uf capacitor? Hi Arron and everyone, you are right! it is not about capacitance. I also noticed that the first time I discovered this simple circuit. In this video: YouTube - Ganga Shakti - Water Power Test 2 I am using a 3.3uf capacitor with the input voltage to the bridge at about 150 volts from my isolation transformer connected to a variac to regular 120 vac from the grid. I am using a one side of a DPDT relay as the switch and the relay coil is triggered by a transistor which is pulsed by my signal generator. The video is not capable of showing the light coming from the spark and you cannot look strait at it with your eyes it is much like the Sun light, this you can see in the video. There is much UV light, just look at the plywood board that the plug is on, you can see the blue light reflect on the wood. If anyone gets to this point stop! and get some heavy UV protection glasses since you will damage your eyes. To play with a disposable camera flash circuit is a great ideal and would be a easy way to also see results. Overunity forum user: calanan has a circuit that he posted using a strobe light that you can copy and post here if you wish. Feel free to copy enything you need as this belongs to the public. It sad about the Krupa plug not coming out! this is the World we have created by not taking responsibility. They would be difficult to make since you would need precision equipment. As Aaron has said, do not be fooled by the simplicity of this circuit. Play safe and find all the uses for it. ADDED: I forgot to mention something important! ...the spark plug does not get hot! even at the level I get it to in the video above. Last edited by gotoluc; 07-05-2008 at 06:15 PM. I didn't realize that capacitor after a discharge through a primary retained any kind of charge. Hi Lighty, from how I see it, even if the cap goes to 0, the HV pulse is seeking that lower potential as long as it is not negative and is going back to common ground. Diode slams off and that buildup explodes to plug. Those caps are pretty springy...not leaky but springy...they pop up a bit very quick. After discharge, these caps I was using spring up to 5v+ after discharge instantaneously. I think if there is some + voltage no matter how low after discharge into the coil, instantaneously, it probably self charges a bit...even if .000000001 lol, that is still a low voltage + potential the hv seeks going back to common ground. Your explanation of your proposed experiment sounds simple but could you draw a diagram? I show this to show how positive can move to positive, as long as it is a lower voltage positive and connected to common ground. Has anyone tryed diode to +(earth battery) on the cap to pull in the potential form the earth? I guess this is what you propose that happens in your circuit ? You'll notice that I propose not just turning off inverter but completely disconnecting it from circuit (as well as the condenser connection) before discharging just to be sure nothing happens there. This next picture shows the proposed polarity reversal. I still have some questions and doubts as to why spark gap is cold. 1. What is the condenser capacity (so that one could calculate stored and released energy)? 2. What is the value of HV voltage impulse and it's duration? 3. Is there any change of the supposed bounced HV voltage impulse polarity? 4. Did you try raising frequency to a few kHz (ordinary car ignition coil should go up to 3-5 kHz)? 5. Did you try significantly raising condenser capacity in order to ensure bigger amount of energy is released? 6. Did you leave circuit to operate at few kHz for prolonged period of time (at least 15 min) and then measured a possible change in spark gap temperature? Please don't get me wrong electro-radiant event might be happening but the total released energy could be so small so that spark might be jumping and igniting water while at the same time the released energy might be so small so not to significantly heat spark gap. When dealing with apparently exotic stuff one must spare significant time and effort disproving possible conventional solutions. That being said I think this circuit is indeed interesting. Last edited by lighty; 07-06-2008 at 02:27 AM. Hi Lighty that looks along the lines of what I'm thinking. Luc and Callanan have taken the experimental phase with this further than I have. I'm so busy with business that I don't have much time to do a lot with this. I'll discuss my opinion on this and how Tesla would see it in another thread. After watching you guys playing around with inverters and such, I thought I better share another method of approaching the problem. I think everyone should take a step back and look closer at this before playing around with those higher voltage approaches just yet. It has to be recognised that the higher voltages will burn up the plugs at a faster rate, and it also has to be remembered that your tests are being done in open air, not under pressure as it happens inside a combustion chamber. You may be going a step too far at this point by looking at amplifying the spark in open air to achieve a white plasma. Once you pressurise the spark it behaves quite differently. I'm not saying my way is right, just that it should be considered. Today I conducted a few tests to see what would happen to the normal blue spark under pressure, as it normally occurs inside a combustion chamber, then I added a few different types of non powered spark "intensifiers" to the equation and watched what happened once pressure was applied to the spark created by each. The results are interesting. I set my pressure bell up on the front of my old test car, hooked a small air compressor to the car battery and attached it to the pressure bell. I then disconnected the plug lead from number 1 cylinder, removed the spark plug from number 1 cyl and replaced it with a dud plug just to block the hole. I fitted the plug I normaly run in number 1 cyl to the pressure bell, and attached the plug lead to it, running straight out of the top of the distributor. This made it possible to run the engine(on 7 cylinders) and view the sparking events as they occurred through the pressure bell window. I started the engine and let it idle, then tried to view the firing plug through the window of the bell. At idle the spark was quite hard to see due to the angle of the plug, I was basically looking at the bottom of the earth strap. I could barely make out the sparking events in normal air pressure. Next I turned on the air pump and built the pressure up to 100psi and applied it to the bell. It was at this point that I noticed a leak at the viewing window of the bell, this wouldn't allow me to pressurise above 75psi in the actual testing cell. Anyway, after 50psi the spark was quite evident yet still appeared to be blue in colour. At 75psi it was quite a bit brighter again, yet still appeared blue. At pressures below 50psi the spark lost its brightness and became hard to see, as in the open air tests. Next I fitted my little $3.50 home made "intensifier" and started the engine. I noted that I could see the spark a little easier in normal air pressure, it was definately more powerful as compared to the unaided sparking events. The sparks were still mostly blue, but were flecked with red/purple. I built up the air pressure to 100psi as before, then applied it to the bell. The spark did the same as in the previous test, yet was noticeably white and quite a bit brighter. I also noted that it hung on longer when the pressure was reduced to below 50psi. It was definately white. Next I fitted an IKAT/ICAT spark enhancer, like what they sell for use on motorcycle engines. It appeared to behave pretty much the same as my home made intensifier. I built up the air and applied it, as before, and it displayed a white spark, definately brighter than a standard sparking event. Next I fitted a Lectran Pulsar, it did the same thing again, as did my home made intensifier and the same thing as the ICAT, I have to admit though, the Lectran did appear to display a brighter white spark than the others, it appeared to hold on longer and stay brighter at below 50psi too. My home made intensifier may need to have the gap altered as I was running it at about 7-8mm, it may work better at a wider gap setting. It would also need a Farady cage made up to capture the RFI as well. My reason for adding this information here is that I feel that by using inverters etc, it may all be in vain, as you can get "into the white" with a lesser spark once you pressurise it above 50psi. I believe that once you add HHO to the equation, along with a water vapour, you should be able to successfully achieve the desired result without wasting precious time over-engineering the matter. Rosco1 is right about things behaving differently between the bench in open air and the real world of high compression in an engine. Here is a PDF for a modified CDI ignition system built for racing engines. It is beyond my ability to build. But maybe if you combined this modified system that fires multiple times with our HV system, it will help us to run on water. The PDF is an excellent article and worth the read. I'm not sure that using an MSD type of ignition is warranted at this point. That type of ignition is better suited to igniting the slower burning gasoline, with it's obvious residuals, that are known to be left behind after the ignition event has concluded. I'll stick with the single discharge for a while longer, given the costs. At least until I see a reason to adopt the MSD anyway. Upon reflection, those added sparking events should have nothing to ignite if HHO is in the equation, given the much more rapid burn rate. I reason that we only need 1 decent white spark to get the show on the road, anything coming after that could just be a waste of resources. It's still early days, so until we know more, it's better to stick with the known methods and cross one bridge at a time. I'm currently uploading video of the tests I mentioned earlier to Youtube, and please don't burn me at the stake for my camera skills, Spielberg I'm not. The only thing that should be considered in the footage are the actual strength and brightness of the spark events captured, and of course the colours. I'll post the link as soon as I'm done.